Upper Valley Career Center partners with Warren County Career Center to provide this top-notch program which prepares some of the most sought after Technician Apprentices in the nation. This is an intense nine-month fundamental training program designed for men and women who understand the challenges and benefits of working as a Line Technician. The program provides the necessary skills to be highly productive on utility and construction company linecrews. The 900-hour program focuses students learning with the mix of academic and field skills needed to be successful as apprentice lineworkers. Contact Program Coordinator, John P. Sullivan at 513.933.3940. 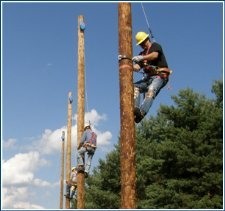 Highly trained, qualified Line Technicians are in demand. According to the U.S. Department of Labor, training of line installers, repairers, technicians, and erectors is critical. Approximately 40% of the current workforce is expected to retire in the next five years, which will leave a vacancy of about 11,300 jobs nationwide. With the expanded network of electrical power lines delivering electricity to an ever-increasing customer base, it is critical that training opportunities be available.